A 90% road ban has been placed on Kneehill County’s gravel road surfaces. Please check our website or call the office for an update. 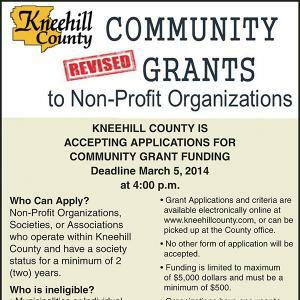 A Request For Proposal (RFP) is being issued by Kneehill County for a Campground Attendant for the 2014 and 2015 season with a possible extension to 2016. This will be for the recreation areas of Keiver's Lake, Braconnier's Dam, Swalwell Dam and Torrington.